Okay, maybe the world is not going to end now that Donald Trump will occupy the Oval Office, at least not immediately anyway, which means we're going to have some time time to observe the royal family,...ahem, I mean "first" family for awhile, until Armageddon sets in. I've especially enjoyed seeing how Melania, Donald ' s Slovenian born wife, handled herself during the inaugural festivities today. 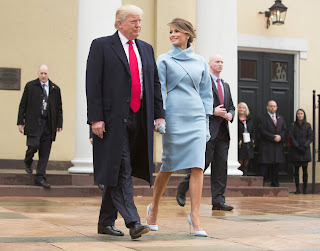 At this moment the Trump family is in the reviewing stand watching the inaugural parade, so we've only had a glimpse of her wearing one outfit so far, a stunning powder blue suit reminiscent of styles and colors worn by none other than Jacqueline Kennedy during her stint in the White House. I can imagine Melania months ago sitting down with her wardrobe team, looking over pictures of past first ladies on inauguration day. "How about this one? This is Mamie Eisenhower." "No, not that one. She looks kind of frumpy." "Too plain. I don't like the boots." "Lady Bird Johnson was very elegant." "That's it! I love it! Make me look like her!" And so a look was born. I have to admit, Jackie immediately sprung to mind when I saw the boxy suit with the matching long gloves and hair pulled back in a chignon. She pulled it off very well. Although she is a former fashion model and should be comfortable in front of the camera, Melania does not seem to seek the public eye. She appeared very little with her husband during the campaign. Today she seemed nervous coming down the steps to face the crowd. Maybe she knows her husband is not that popular and is apprehensive about filling the roles vacated by a hugely popular president and First Lady. The demands of the First Lady are really quite simple. Stay in the background and look nice. That's all that's really required, though many First Ladies choose to use their position to champion a favorite cause. Melania will surely find her way and grow into the role. She has four years to make herself at home in the White House and decide how involved she wants to be in the public discourse. If nothing else, she will surely be a fashion icon and be a beautiful and elegant distraction from the sometimes ugly business that is politics.